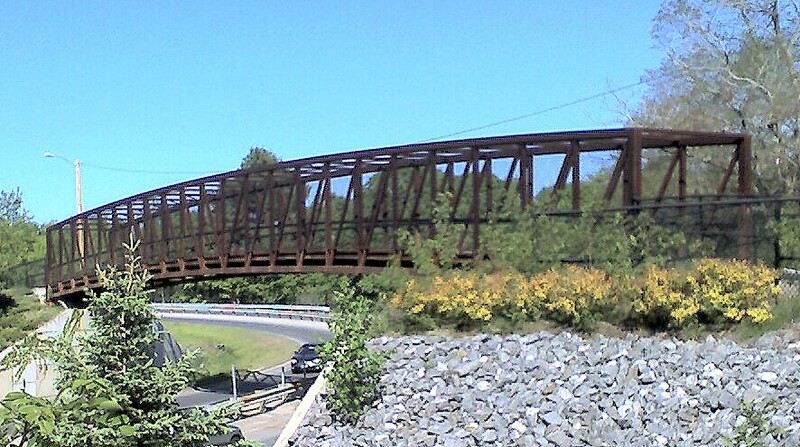 On a recent trip, I came across this pedestrian/bicycle bridge on a northern section of the East Coast Greenway. As we in Durham consider the future of our own pedestrian/bicycle bridge over the Greenway (American Tobacco Trail Phase E), I figured it'd be relevant to snap a few photos. This bridge goes over an entry ramp to US-1 which means its has far less traffic than the section of I-40 where the American Tobacco Trail will cross. The only thing I can tell you that isn't captured in the photos is that its pretty loud. I was surprised. If this small bridge is any indication of what the experience crossing the ATT Phase E bridge will be, I don't think we need to be building a bridge on which someone will want to meander or stop for a break. We'll want this to be a bridge the gets people from point A to point B safely and effectively and provides them pleasant areas on either side. Hey Jack - The bridge over the I440 loop in Raleigh near the Art Museum is really loud and not a pleasant place. It's much more fun to look at than to travel over.